Trusty Friend Rogue Nine helped get me started blogging a few years back. You’ll either thank him or make rude gestures at him for that. Just don’t send him hate mail. He’s really cool, even though he’s a lawyer now. Originally, I thought this would be a blog that was just about Geeky Mom stuff. However, it’s expanded to all sorts of things, some of which are entirely unrelated to anything geeky, such as recipes or discussions of flowers for zone 5 or 6. It has also ended up being my training ground for learning how to write articles. 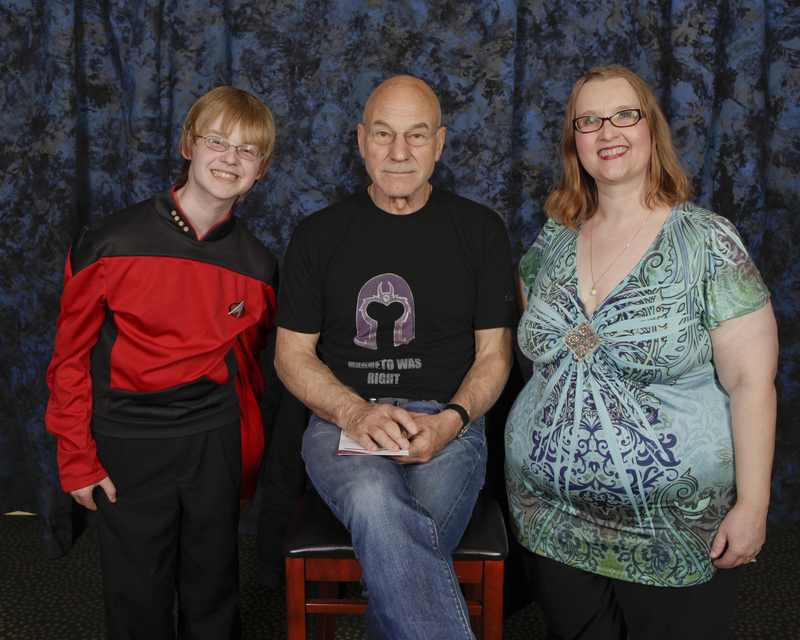 My son and I geeked out with Sir Patrick Stewart at a Star Trek Convention! I’m a wife, mom, sister, daughter, doctor, reader, writer, home chef, gardener, and all-around geek. I am blessed to be called ‘friend’ by many, both online and in ‘Real Life’. I love just about anything to do with gaming, unless it involves first-person shooters. I’m terrible at those, and rather than give myself some kind of complex trying to conquer them, I finally just decided to concentrate on RPGs and Rock Band 3, where I can a. mod the game or b. make the Top 50 on the Rock Band 3 Xbox leaderboards for vocals on the songs I like (I’m Jae_Onasi there). This is much more fun. Since I write for TORWars.com as well, you’ll find links to the articles I’ve written for them, too. If you like playing Star Wars: The Old Republic, you’ll love their site. You might see a smattering of politics and religion here, too. I am an avowed Christian, albeit one who is quite imperfect and in need of forgiveness many times. I am also a raging moderate. I’m very conservative on some things, liberal on others, and generally ‘middle of the road’ on most things. Unfortunately for Congress, being a moderate is about as popular as being someone with the bubonic plague. I pick and choose my subjects in this arena, mostly because I despise trolling and the lack of civility that happens far too often when discussing these topics. As a mom, I have plenty to share on parenting from infancy to teens. We are actually surviving the teen years, believe it or not. This is a minor miracle. I love humor, too. I grew up reading Dave Barry, Henry Beard, and Delia Ephron. My dad played Bill Cosby all the time. A day without a laugh would be a nightmare. Not all of my posts are humorous. Some are. Some have enough acid in the satire to make a lemon pucker. I hope you’ll enjoy them. If it’s a geeky topic, you’ll discover it around here somewhere, generally. You’ll also find information on ADHD, food allergies, pets, gardening, cooking, writing, birdwatching, cats, dogs, weather, and just about anything else I happen to feel like writing about on that day. If you have questions, want to share comments, feel like suggesting a topic, or are interested in seeing if I am available to write articles or other material for you, feel free to contact me here or on Twitter @JaeOnasi.